This view of a regatta looks towards the Rialto Bridge on a Grand Canal thronged with gondolas and other boats. In the middle, to the left, is a bissona, a highly decorated ceremonial gondola with the figures of Cupid at the prow and Fame at the stern. 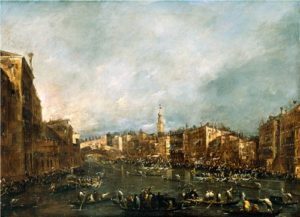 Guardi’s painting may show the festival which was organised to commemorate the visit of Grand Duke Paul of Russia in 1782. Guardi painted numerous views of Venice for visitors. 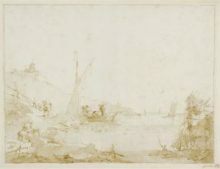 They were freer in their handling and more atmospheric than those of the older Canaletto.